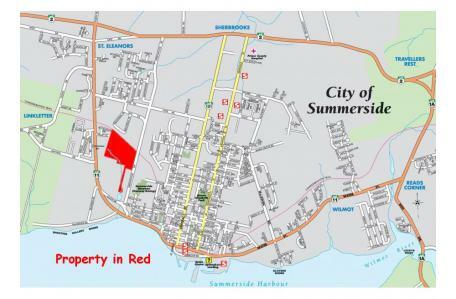 Amazing parcel of vacant land almost 60 acres located within the city limits of Summerside. This is by far the last large parcel of Industrial (M1) property available on Prince Edward Island. The North boundary of the property has 1,928.26' along the Confederation Trail which also borders the Summerside Business Park. This property has access to 3 municipal roads; Valley St. and Lockwood Dr. on the West and to the East an amazing 1,145.56' frontage on Greenwood Dr. This land is currently farmed with an area of brush and mature trees to the south. Water and sewer access the property at 3 locations. Owner willing to sever lots along Greenwood Dr. as per purchaser’s requirements. NOTE: Price per lot will be determined by size and location. ALL OFFERS MUST BE CONDITIONAL UPON OBTAINING THE SEVERANCE. More information can be found at the following web site: www.linkletters.ca.